Adopt a Greyhound! We did! That'a our boy, Guthrie, pictured. Cute, right!?! 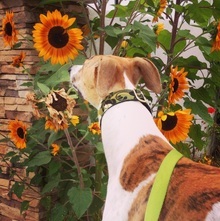 The Greyhound Adoption Center (GAC) is a California-based 501(c) 3 non-profit organization that rescues, rehabilitates and places greyhound dogs in loving homes in California and Las Vegas. Volunteers and donations are always welcome! The facility is lovely, Ty & C.C. both volunteer here. We encourage you to, too! The hounds have the best care and the spirit is loving and gentle. Healthy Paws Pet Insurance - We Love It! The danger of foxtails goes beyond simple irritation. Because these tough seeds don't break down inside the body, an embedded foxtail can lead to serious infection for your dog. It can even lead to death if left untreated. The seeds can be hard to find in your dog's fur. 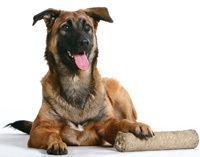 So how can you tell if your pooch has a foxtail that’s causing problems? If you find a foxtail should you extract it? And when is it time to call a vet?..." Second Chance Dog Rescue - Pridey Girl Petcare is a proud supporter of Second Chance Dog Rescue. Second Chance Dog Rescue is one of San Diego’s largest and most successful non-profit 501c3 organizations dedicated to saving homeless dogs. If you have room in your home and your heart to foster or adopt, please contact this wonderful organization. Are you a Small Business Owner, too? Need help figuring out Payroll? Need help with PAYROLL? BENEFITS? State and Federal taxes? Workman's Comp (do you even need it in your state?) Figuring it all out! We wanted to do everything 'by the book,' and it was so complicated on our own! We really, really needed a great solution. Then we found Gusto, they are brilliant! We switched from Intuit about 8 months ago and will never look back! Gusto has been absolutely turn key, offering the best (US based) customer service, intuitive interfaces and great reporting and tax payments... OMG! Just click through our referral link and you'll get $100 for trying them and you'll be in love, too! You can purchase pet first aid kits at our local Humane Society 'Muttique' located on Gaines Street in San Diego or order it through Amazon with Prime Shipping. Click here and you'll find a list of items that any well stocked pet first aid kit should contain. Keep a kit in your home and in your car if you travel with your pet. Let's start out by saying which leash we do LOVE - it's a 4' leather lead with brass clip, made in the USA, it'll last you a lifetime with proper care and give your pup the room and boundaries he needs to learn proper loose-leash walking skills. ​Now, more on why retractable leads are actually dangerous "...Retractable leashes are popular primarily because they aren't as confining as regular leashes, allowing dogs more freedom to sniff and poke around on walks. But unfortunately, there are many downsides to this type of leash..."
PLEASE trade in your retractable leash for a sturdy 4' or 6' leash - it's so much safer for you, your dog, and my dogs, too! Knowledge is our greatest tool! Know what is in conventional mass-marketed pet food. I use and recommend Wellness products, I feed them to my pets and I believe they are the main reason why my fur babies maintain such excellent health. Give good food a 30 day trial and see the difference it makes in your own animals. You can also search for the brand of food you feed your dog at The Dog Food Advisor to see what's REALLY in the ingredients - if you're pups food isn't well-rated, consider upgrading and watch their health improve! Never get in the middle! ﻿"NEVER physically get in the middle of two dogs fighting. If you put your hand (or other body part) anywhere near the heads of these dogs you WILL be injured. This includes trying to grab their collars. Don't be foolish enough think a dog will not bite its beloved owner... Remember, if your dog is injured, he will need you to take care of him. You can't do this from a hospital bed..."
Awesome pet and animal inspired gifts and merchandise, every purchase provides at least 14 bowls of food for a rescue pet in need! Here, you can find groovy t shirts and tunics, animal themed jewelry, accouterments for your fur kids and so much more! Linda Michaels, M.A., Psychology, focuses on the psychological aspects of behavior modification and basic manners courses for your dog. Linda was named one of the Top Ten Trainers in the US by Top Ten Magazine and is a Victoria Stilwell-licensed behavior consultant. All Problems. All Positive. Private and Customized. If you need help with Housetraining, Aggression, Separation Anxiety, Leash-walking and more, contact LInda today. When our pup is feeling 'ruff,' we take him to our favorite local dog wash, groomer and pet boutique for a little pick me up and 'paw'dicure! The ladies who work at Barks are the best! Caring, experienced and friendly and they are as gentle with our baby boy as we are! 1) There are inherent imperfections in measuring T4 levels. 2) Normal greyhound T4s are lower than those in the general canine population. While it is true that some germs can be dangerous, so are the chemicals in the cleaners that claim to eradicate ...germs! The toxins contained in most commercial cleaners are unhealthy for us and the environment.